It’s that time of year – Spring Cleaning. Tom and I have been busy re-organizing our home. Our focus this year is my library, a room that I adore. 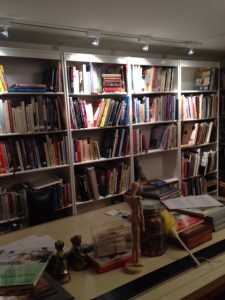 We have about 2,002 books (2 are tom’s) in my professional library. WOW is right. This year we made the decision to scale it back. 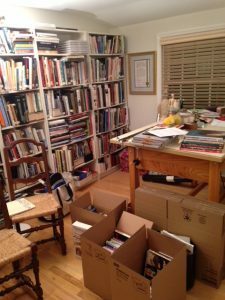 So far we’ve packed up 5 boxes of books (about 100 books in total) and donated them to a local charity, Silvermine School of Art. These are all art books – of course. Even though it’s hard getting rid of things we love, it’s important for our peace of mind. Why? Because we need “white space” in our lives. That extra space where we can reflect and relax. Clutter can lead to anxiety and after the heaviness of winter, it’s time to let go. So if you’re pondering the clutter in your own home, think about how liberating it will be when you let go, and give yourself the gift of “space”. Thanks Pat for the details of your move. And your comment. All the libraries are always looking for interesting books. Thanks Manami for the comment. How are you? Hi Manami, thanks for the comment,it’s a job, let me tell you. Yikes and I only have 1800 more books to sort through. But seeing white space on those shelves is sweet. You actually have seen my library, haven’t you. How are you and yours? Great inspiration! I have been thinking to do the same!